Can we please appreciate all seven members and not only one? Who agree? 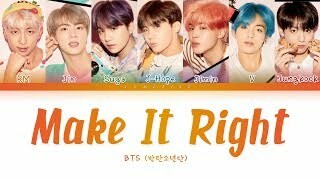 Okay we all listening to make it right more than boy with luv here !! JHOPE..! Went U sing my Heart is OMG U know! Finally flexing J's vocals! Originally tried out for vocals, but then was changed to rap! Wowwwwww and the live performance was so good, too! Thank you so much for the English translations!! I appreciate you now I can fully understand the beauty of the song by knowing exactly what they are saying. Love You ARMY!!!!!! I LOVE this song! I’ve listened at least 100 times today! Jungkook harmonies while Suga is singing it's just heavenly. I love this track💓 wanting me to lie on my bed all day long with this reapeatedly playing. Agh all there voices. This is why this is my favorite song. 00:47 anyone else think this verse sounds like Lauv Different Way?